Since Donald Trump has won the U.S. election and became president-elect, eyes are on the markets to see how the world reacts. So far, investors are mostly optimistic. Stocks surge, banks are having a good time and other industries have a bright future too. What are the details and reasons behind all this? First of all, Trump’s program has several points that can help the markets. As MarketWatch wrote: “Trump’s fiscal policies, if implemented, would be bullish for stocks”. The reason is simple: more spending on infrastructure and lower taxes are usually really good for stocks. Spending more on infrastructures will probably help other companies in heavy industries, like construction and mining. This can also be seen on their stocks, too. On the other hand, the tech industry may have a mediocre time in front of them. Trump really wants them to bring home their money kept abroad and that worries investors. The situation of bonds isn’t simple either. On the one hand, Trump’s presidency may bring higher debt levels that pushes the bond yields higher as well as we can say that the era of deflation is over. On the other hand, we are on the edge of higher inflation which is generally bad for bonds but good for commodities. Higher yields and interest rates help commercial banks as well because they can reach higher profits. What’s more, Trump may soften up banking regulations which would generally help banks and kick off a new era of lending. This made American banks skyrocket already but Deutsche Bank’s stocks rose 20-30% in a week too. Oil will probably also have a great time as Trump is pro-fossil. He denies climate change, wants to leave the Paris Agreement and wants to rev up oil and coil usage. This helped these commodities rise. In the meanwhile, gold only had a short period of shine: the results of the election shook the markets but only for half a day, and gold, the classic safe haven sank back to that levels we have not seen since May. Probably more consolidation is going on on the gold market but investing in gold below $1200 seems to be the right decision. As we can see, altogether the market is intact, but there are some changes. Some industries have better times than others and this may go on in the future. 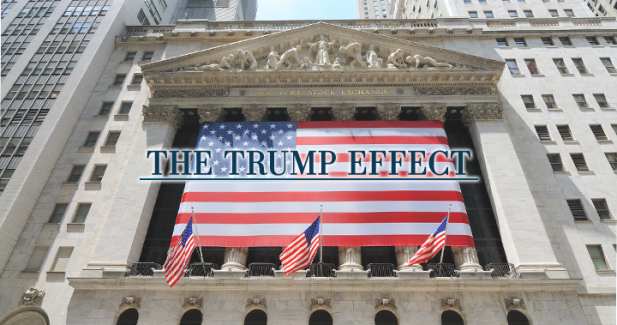 But there are some risks because market participants seem to be concentrating on the potential bright side of the Trump’s effect, however, until the inaugural ceremony lot of things could happen. That’s why diversification and long-term investments are still the best idea to keep our money safe.